Review Summary: On the whole DHAMAAL is one joyride that should keep its investors smiling! It's a banana bunch that ends in Goa chasing a dream that takes them through sundry silly twists and turns that find you grinning as you jump onto this jolly ride. On the whole DHAMAAL is one joyride that should keep its investors smiling! In sum, Dhamaal isn’t exactly what the title promises. But it does have its laugh-out-loud moments.. it’s not bad at all. Go ahead and try. It started with Partner eight weeks ago. A full to time pass comedy. No harm in watching. To think about it, the plot of DHAMAAL is as straight forward as this. There is ten crore worth of booty hidden at a park in Goa and there are five men after it. Four of them are good for nothing youngsters [Riteish Deshmukh, Arshad Warsi, Javed Jaffrey, Ashish Chaudhary] while the fifth is a cop [Sanjay Dutt]. Later they are joined by a wannabedacoit [Sanjay Mishra] and Ashish's father [Asrani]. Finding the booty isn't a rocket science in itself. It is the journey from Bombay to Goa which turns out to be one, courtesy the stupidity that comes so intrinsically to each of them. 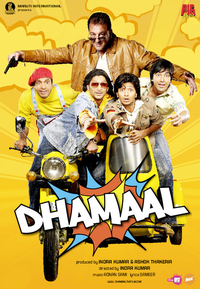 Despite the minor flaws though, Dhamaal is similar to David Dhawan's brand of comedies: Fully dhamaal!